Thousands of people in Washington, D.C., braved winter weather to stream through Halls B and C at the Walter E. Washington Convention Center for the 2019 NBC4/Telemundo44 Health and Fitness Expo. Those who attended the Jan. 12–13 event took advantage of the various information sessions, health screenings, and fitness demonstrations offered by more than 200 exhibitors. The George Washington University (GW), through clinical partners the GW Hospital, the GW Medical Faculty Associates, and the GW School of Medicine and Health Sciences (SMHS), served as the largest medical participant at the expo this year, offering screenings, demonstrations, and presentations on the main stage. Over the two days, visitors toured the GW Health Village and about 1,000 people received blood pressure, BMI, and diabetes screenings. They also took advantage of the opportunity to receive wound care and foot and ankle consultations. 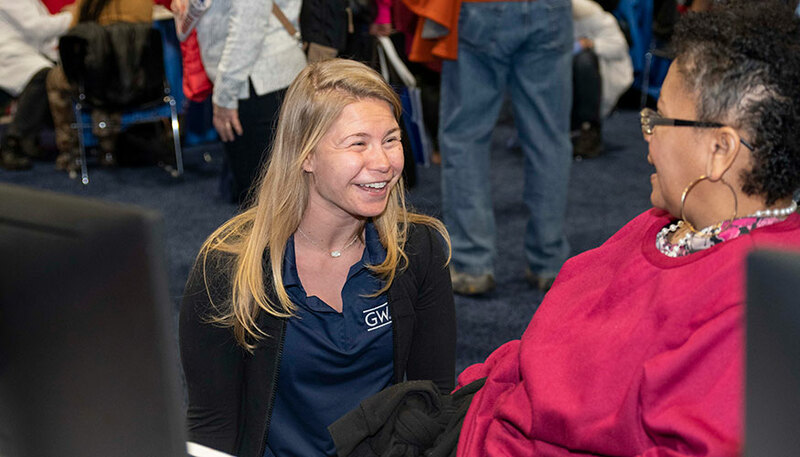 Expo visitors also had access to healthy cooking demonstrations, sports medicine consultations, as well as information sessions about cancer, general health, cardiac care, kidney transplants, and the GW Mammovan. First-year SMHS physical therapy student Dana Schwartz volunteered at the ergonomics station. Several GW faculty members delivered presentations on the expo’s main stage, including Babak Sarani, MD, director of the Center for Trauma and Critical Care, who discussed the Stop the Bleed movement, and Vivek Jain, MD, director of the GW Sleep Disorders Center, who offered tips of how to sleep better.